Reportlinker.com has released a new market research report, now available in its catalogue: Global Military Communications & COTS Market 2013-2023. Effective, efficient and reliable military communications remain one of the most integral components of any modern military force. Diverse yet highly connected, network centric theatres of operations demand robust, wide ranging and accurate communications equipment and services in order to share, process and distribute vital real-time situational data. As a consequence, investment in military communications systems and services is set to continue throughout the next decade, despite significant budget cuts, economic limitations and potential technological challenges. Visiongain has therefore determined that the value of the global military communications & COTS market will reach $17.46B in 2013. 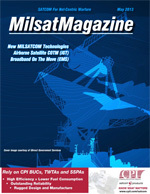 Greater focus within the market is expected in high technology SATCOM systems and services through increased public and commercial partnerships, COTS based equipment as an operational and cost saving mechanism and greater protection and security for communications data as part of overall cyber security investment. What makes this report unique is that Visiongain consulted widely with industry experts and full transcripts from exclusive interviews with Gilat Satellite Networks, Pentek Inc. and SkyWave Communications are included within the report. The reports therefore have a unique blend of primary and secondary sources providing informed analysis. This methodology allows insight into the key drivers and restraints behind market dynamics and competitive developments, as well as identifying the technological issues. The report also presents an ideal balance of qualitative analysis combined with extensive quantitative data including global, submarket and regional markets forecasts from 2013-2023all identifying strategic business opportunities. The report comprises 265 pages. Discover market forecasts, technological trends, predictions and expert opinion providing you with independent analysis derived from Visiongains extensive primary and secondary research. Lockheed Martin has integrated two of the most important components onto its fourth Mobile User Objective System (MUOS) satellite for the U.S. Navy. Recently engineers mated the multi-beam assembly, which hosts 16 ultra-high frequency (UHF) antennas for distributed, global communications coverage. Earlier this year, the team delivered and integrated the vehicles communications system module. With bus and payload now together, the satellite is entering its first system check-outs before progressing to environmental test. Supporting UHF satellite communications, MUOS will provide mobile warfighters with assured communications, including the new capability of simultaneous voice, video and data for mobile users. Designed and built by Lockheed Martin in Newtown, Pennsylvania, and delivered to the companys facilities in Sunnyvale, California, the antenna and system module enable communications coverage using the wideband code division multiple access standard. This provides a 16-fold increase over legacy UHF communications in the number and capacity of satellite links. The first MUOS satellite and associated ground system already provide legacy UHF communications capability. The second MUOS satellite recently completed system testing and is undergoing final preparations for shipping, then launch in July. The third spacecraft is progressing through environmental testing. The five-satellite, global constellation is planned to achieve full operational capability in 2016. Lockheed Martin is under contract to deliver four MUOS satellites plus a spare and the associated ground system to the U.S. Navy. Lockheed Martin Space Systems in Sunnyvale is the MUOS prime contractor and system integrator. The Navys Program Executive Office for Space Systems, Chantilly, Virginia, and its Communications Satellite Program Office, San Diego, California, are responsible for the MUOS program. United Launch Alliance (ULA) has cleared the launch of the WGS-5 mission, after thorough flight clearance process that was executed following a flight data anomaly that occurred on the Global Positioning System (GPS) IIF-3 launch on October 4, 2012. The ULA/PWR investigation concluded that a fuel leak within the upper stage RL10 engine system was the direct cause of the lower than expected engine performance on the GPS IIF-3 launch. To prevent a recurrence of this sort of fuel leak, the engine and vehicle systems have been very thoroughly inspected and also launch vehicle hardware modifications and changes to how the engine is operated during launch were implemented. Engine testing that was performed to support this ULA investigation replicated fuel leaks like those observed in the GPS IIF-3 launch. The mitigations that have been implemented include extensive engine and launch-vehicle inspections to ensure that there is no damage and that there are no foreign objects that could cause problems for the operation of the engine system during launch. Additionally, launch vehicle hardware modifications and operational changes have been implemented to mitigate risks for the WGS-5 mission and future launches. The hardware modifications include the addition of in-flight helium purges to critical areas of the engine system. The operational changes to reduce risk include changes to how the engine is thermally conditioned in-flight to prepare for the first engine start following the booster phase of flight. ULA program management, engineering, test, and mission support functions are headquartered in Denver, Colorado. Manufacturing, assembly and integration operations are located at Decatur, Alabama, and Harlingen, Texas. Launch operations are located at Cape Canaveral AFS, Florida, and Vandenberg AFB, California. A Ball Aerospace & Technologies Corp. Earth observation satellite built for the Canadian government has concluded its mission after serving the organization for more than 17 years thats 12 years longer than its mission life. By circling the Earth once every 101 minutes, Radarsat-1 relayed images for use in resource management with details about the Earths geologic features, oceans, ice, weather and vegetation. The satellites powerful synthetic aperture radar instrument acquired images of the Earth, day and night, in all weather and through cloud cover. Radarsat-1s legacy included mapping regions of the Earth never mapped before including areas in South America, Africa and Asia; and completing a survey of the Antarctic continental ice shelf that helped monitor the effects of global climate change. Ball built the Radarsat-1 spacecraft bus based on technical experience gained developing the Earth Radiation Budget Experiment for NASA and the Relay Mirror Experiment satellite for the U.S. Air Force. More recently, Ball continues its contributions to NASAs Earth science program with the launch of the Operational Land Imager aboard the Landsat Data Continuity Mission to extend the 40-year record of continuous land surface observations. Harris Corporation has been awarded a $45 million contract to support Department of Homeland Security (DHS) Immigration and Customs Enforcement (ICE) tactical communications networks. Harris will team with Computer Sciences Corporation and other subcontractors to provide round-the-clock technical support for the frontline operations of approximately 15,000 law enforcement officers. The Harris team will support the agencys existing tactical communications networks at multiple locations in the continental U.S., Puerto Rico and the U.S. Virgin Islands. The team brings more than 20 years experience delivering world-class integration services to some of the largest networks in the world. The contract was awarded through the five-year, $3 billion DHS Tactical Communications (TacCom) indefinite delivery/indefinite quantity (IDIQ) contract vehicle. Harris was selected to provide land mobile and tactical solutions under all five technical categories of the TacCom contract vehicle. The IDIQ supports DHS and its partner agencies such as the U.S. Department of State, the U.S. Department of Justice, the U.S. Department of the Interior, and the White House Communications Agency. In IT Services, Harris designs, deploys, operates and maintains secure communications systems and information networks around the globe. Kratos Defense & Security Solutions, Inc. has revealed that Kratos SecureInfo, Kratos dedicated business group of cybersecurity experts, has been awarded a license as a Special Agent of the Certifying Authority (ACA) from Air Force Space Command (AFSPC). Kratos SecureInfos selection is based on 30 years of leadership in the satellite industry, its understanding of the unique security requirements for space systems, and its extensive track record of successfully helping the Air Force secure its information assets. Kratos SecureInfo will serve as an independent and trusted agent, conduct system security assessments, and make certification determination recommendations to the Space Certifying Authority in direct support of program managers and system owners. Recently, Kratos SecureInfo also introduced its new SATCOM Cybersecurity Assessment service that addresses the increasing threats and unique requirements for the commercial satellite industry. The assessment delivers a detailed view of satellite network preparedness along with recommended steps to mitigate risks and ensure compliance with applicable regulations, standards and guidelines. Orbital Sciences Corporation has been selected by the National Aeronautics and Space Administration (NASA) to design, manufacture, integrate and test a new heliophysics science satellite that will investigate the connection between space weather storms in the ionosphere, located at the edge of outer space, and Earths terrestrial weather. Orbital will provide its LEOStar-2 spacecraft platform and conduct systems integration and test for the Ionospheric Connection Explorer (ICON) mission at its Dulles, Virginia, satellite design and production facilities. Orbitals contract for the two-year mission is valued at $50 million. The mission, which will be led by the University of California at Berkeley, is currently planned for launch in 2017. The mission of the ICON satellite is to study the interface between the upper reaches of the Earths atmosphere and outer space in response to a recent scientific discovery that the ionosphere, positioned at the edge of space where the Sun ionizes the air to create charged particles, is significantly influenced by storms in the lower atmosphere. ICON will also help NASA better understand how atmospheric winds control ionospheric variability. The mission, selected for its scientific value and low-risk development plan, will improve the forecasts of extreme space weather by probing the variability of Earths ionosphere with in-situ and remote-sensing instruments. Fluctuations in the ionosphere can disrupt satellite and radio communications from low- and geostationary-orbit communications spacecraft, creating a direct impact on the nations economy. The scientific findings resulting from the ICON mission could, for example, benefit commercial aircraft, as GPS signals can be distorted by charged-particle storms in the ionosphere. ICON was awarded under NASAs Explorer series of lower-cost and highly-productive space science satellites. Orbital has built multiple Explorer satellites for NASA, including the in-orbit NuSTAR, Swift, GALEX, AIM and IBEX spacecraft. In addition, Orbital was recently awarded a $75 million contract to design, build, integrate and test, as well as to perform mission operations, for another Explorer satellite, the Transiting Exoplanet Survey Satellite (TESS). The ICON program is being led by Principal Investigator (PI) Dr. Thomas Immel of the University of California/Berkeleys Space Sciences Laboratory (UCB/SSL) and mission management is performed by UCB/SSL under NASAs Goddard Space Flight Center Explorers program. The PI-led ICON mission features partners from the Naval Research Laboratory and the University of Texas/Dallas. Mission Operations will be performed by the UCB/SSL Mission Operations Center, which is currently operating the Orbital-built and launched NuSTAR astrophysics Small Explorer satellite. The current LEOStar-2 product line has demonstrated an exceptional record for reliability, with four currently in orbit, another in production, and the TESS and ICON programs to be started later this year. Secretary of the Air Force Michael Donley has announced his plan to step down on June 21st as the Air Forces top civilian after serving for nearly five years. Donley was confirmed as the 22nd secretary of the Air Force Oct. 2, 2008. He served as the acting secretary since June of that year, as well as for seven months in 1993, making him the longest serving secretary in the history of the Air Force. He also served as the services top financial officer from 1989 to 1993. The U.S. Navy has awarded Northrop Grumman Corporation (NYSE:NOC) an $80 million contract to upgrade and enhance the Next Generation Command and Control Processor (NGC2P). The NGC2P system is a tactical data link communication processor that provides critical real-time information about friendly and enemy activity during combat operations. The five-year, indefinite-quantity, indefinite-delivery NGC2P Technology Refresh and Link 22 contract was awarded on January 9th by the Space and Naval Warfare Systems Command (SPAWAR), San Diego. An additional two-year option would bring the total value to $95 million. Northrop Grumman will provide software and hardware system development, engineering services and technology refresh field change kits for the communications processors aboard naval surface ships. Northrop Grumman will first provide designs addressing obsolescence issues in the current system. These improvements will increase computational capacity and later support system capability enhancements and new capability insertion, such as integration of the Link 22 secure digital radio link. Northrop Grumman was first selected to develop NGC2P in 2008. The Northrop Grumman NGC2P team includes GET Engineering, El Cajon; FUSE Integration, Inc., Long Beach; and Technology Unlimited Group, San Diego, all based in California. Harris Corporation has received a $29 million order to provide a nation in Asia with Falcon III® wideband tactical radios. The radios will provide the countrys armed forces with critical country-wide data communications and improved mission capabilities as part of an overall modernization effort. The nation is acquiring the companys new RF-7800H high-frequency wideband manpack and RF-7800W High-Capacity Line-of-Sight radiosthe former is the worlds first HF radio with high-speed wideband data capabilities. These advanced capabilities allow users to efficiently transmit large data files such as video images over very long range beyond-line-of-sight links. The radio is 20 percent smaller and lighter and offers data rates that are 10 times greater than other HF radios.